Unionists have condemned Óglaigh na hÉireann poseurs who fired shots in the air and issued threats against drug dealers in the County Londonderry countryside on Friday. DUP MLA Gary Middleton condemned the so-called ‘show of strength’ in Park. “There is no place in our society for terrorist style activity. The people of Park village, or anywhere in Northern Ireland, do not want to see people taking the law into their own hands. “There has been much good work done on a cross community basis in the Park village area. We must ensure that we do not allow the evil within our society to divide our communities and create an atmosphere of fear and intimidation. 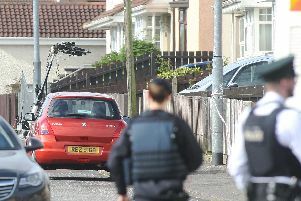 Policing Board member and West Tyrone UUP MLA Ross Hussey also condemned the gunmen, observing one photograph showed a hand gun which did not appear to be new stock, raising questions about where the weapon came from. “The appearance of weapons once again begs the question as to what actually was decommissioned. One photograph showed a hand gun which certainly did not appear to be new stock and I shall be raising the incident with the Chief Constable. Mr Hussey said it was up to the police to deal with drug dealers not self-appointed vigilantes. “The north west of Northern Ireland has been subjected to a number of incidents whereby dissident so-called republicans have sought to threaten or use violence to instil fear in communities and engage in attacks on the security forces. “Last Friday three masked men appeared in the normally quiet village of Park, issued threats against drug dealers, fired three shots in the air and left.